Oculus Rift Dev Kit Observations and Tips submitted by plex. It really does have a ton of 'wow' factor. The field of view is amazing, and the head tracking makes looking around an environment feel much more natural. The 3D effect is very good, and a friend who generally has issues with 3D in things like movies didn't seem to have an adverse reaction to the Rift. UI is going to need to be redesigned for it to work on Oculus - text needs to be in the middle of the screen and it needs to be BIG. I played through the TF2 tutorials, and the on screen instructions were not readable. 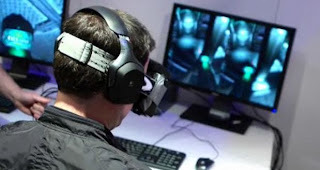 Head tracking is great, but if you move your head quickly there's a bit of a blur (it's possible that this was related to software rather than hardware). The responsiveness is very good though - it never felt laggy, it just felt like I needed to stop turning my head before things would get back into focus. Motion sickness your first time using it is nearly guaranteed. The second time I used it I was fine, so you do get used to it. You can use the headset over glasses, but it's slightly awkward. While the consumer version will hopefully be slightly better in this regard, contact lenses are going to be a better experience. Using glasses with it reduces the field of view. The lenses it comes with (3 different sets, one for 20/20, one for mild nearsighted, one for very nearsighted) can correct for nearsightedness, but don't do anything to help with astigmatism. I played TF2 offline to get a feel for the Rift in a game setting, and it worked extremely well. They split aim and head direction, and it felt very intuitive after a short time. Being able to focus visually in one direction while aiming elsewhere was very nice - definitely felt like I was able to be more aware of my environment than I usually am in a FPS - I think that environmental awareness may be one of the bigger things that the Rift can bring to first person games. Separating vision direction from aim seems simple but it does a lot. I haven't really played much TF2 previously, so I can't compare the experience with vanilla TF2 though. I didn't notice any FPS issues. The Rift is just acting as a monitor, so FPS issues are still likely going to be the fault of your CPU/GPU rather than the headset.